stockOzone - Financial Blogs | Stock Analysis | Expert Investing Ideas | Global Market News Nasdaq Lagging in 2010; Will It Continue? 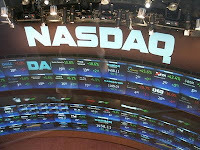 Nasdaq Lagging in 2010; Will It Continue? Taking a look at the 4 major index ETFs -- SPY for S&P 500, DIA for Dow Jones Industrial Average, QQQQ for Nasdaq 100, and IWM for Russell 2000 -- one can see a clear laggard thus far in 2010 ... the "Qs". If you examine the price performance change chart covering this calendar year, you can see that the IWM (blue), SPY (green), and DIA (red) are in a similar performance range, while the QQQQ (yellow) has been an underperformer. 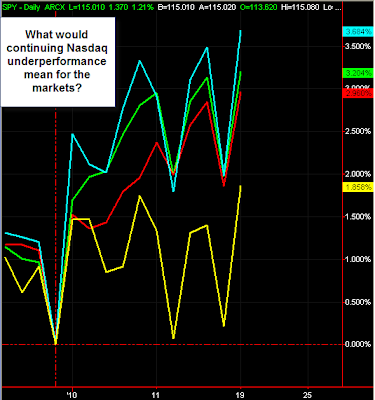 What would continued Nasdaq underperformance mean for the markets? Well ... this index is certainly more geared to technology, biotech and growth than the DIA and SPY. But the small-cap Russell 2000 (which has many growth stocks) is also outperforming the Qs, so that is a bit contradictory. In this case it looks like the weightings of the QQQQ explain the lagging performance. Basically 4 companies, Apple (AAPL), Google (GOOG), Microsoft (MSFT) and Qualcomm (QCOM) comprise over 32% of the holdings as of the latest data. AAPL alone is over a 15% weighting. Thus, the performance of these giant technology bluechips will have a large impact on future QQQQ performance. *Moby Waller is Portfolio Manager for BigTrends.com's Index Options Timer and Advanced Options Strategies advisory programs and is a Research Analyst and Trading Coach for BigTrends.com . He also regularly contributes Daily TrendWatch and MidWeek Update articles for the BigTrends website. Moby's writing and analysis can also be seen on financial. Sir, your analysis is right.